The U.S. House Appropriations Subcommittee on Transportation, Housing and Urban Development (THUD), released their fiscal year (FY) 2019 budget proposal that is mostly in line with budget requests Prosperity Indiana urged legislators to support, but there are some areas of concern for members to be aware of that we plan to focus advocacy on before the bill comes before the full Committee in the coming weeks. Overall, the bill maintains the omnibus funding levels which represented a 10 percent increase in funding housing programs compared to the prior fiscal year which is an important victory for affordable housing advocates. Additionally, the bill is $11 billion above the Administration’s request and does not include the rent increases or work requirements proposed by Secretary Carson. As outlined below, many programs would receive level funding or modest increases, but this bill does have some concerns for our members. Proposed cuts or shortfalls include $162 million less for the HOME Investment Partnerships program compared to FY18 and funding for Project-Based Rental Assistance and Housing Choice Vouchers that is not sufficient to cover contract renewals. Programs that received level funding include Public Housing Operating and Capital Funds and Community Development Block Grants. Additionally, funding is provided for 811, Housing for People with Disabilities and 202, Housing for the Elderly, at levels to renew contracts. There were modest increases for Housing for Persons with AIDS, Homeless Assistance Grants, HUD Policy Research and Development, and new funding for a mobility voucher demonstration for families with young children to assist in moving to areas of opportunity. On May 7, The Consumer Financial Protection Bureau (CFPB) released the 2017 Home Mortgage Disclosure Act (HMDA) data, detailing mortgage lending information from nearly all lenders across the country and the trends are troubling for low- and moderate-income (LMI) borrowers. 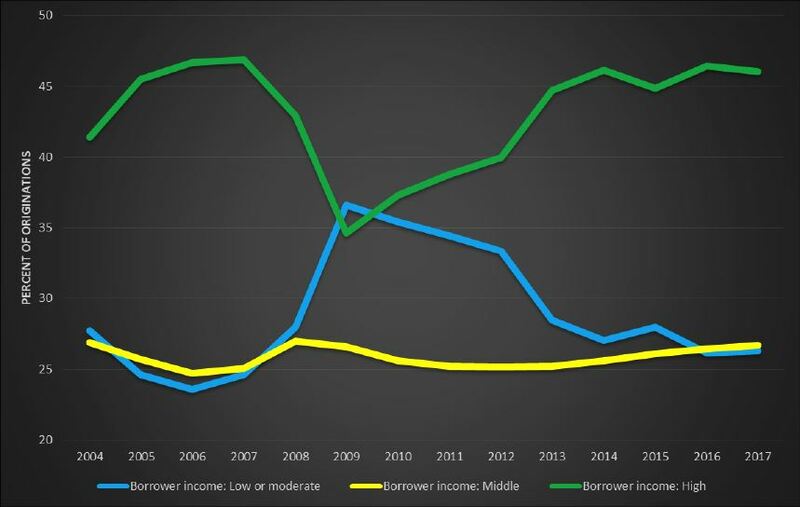 Banks have significantly reduced loan originated for low- and moderate-income borrowers and these income brackets have continued to decline as a share of all home buyers overall—a decrease of more than 10% since 2009. There are numerous causes, including wage stagnation while housing costs increase, tightening loan standards, but also larger banks are not as actively offering FHA/VA mortgages which cost them more originate than conventional mortgages. In fact, the data overall suggest that banks, to some extent, are transitioning to other credit products and away from mortgages. That explains how non-bank lenders, those financial institutions that do not take or hold deposits, have dramatically increased their share of mortgage lending, particularly for LMI borrowers. They now accounted for 56% of all origination in 2017. Nearly half of LMI borrowers use FHA/VA loans to buy their homes, but the top three bank lenders reported an average of just 15% of their lending went to LMI borrowers, compared to 29% for the three largest non-banks. The largest non-banks use FHA/VA loans for their borrowers 35%-45% of the time. There are also important data implications for borrowers based on race. Black and Hispanic borrowers use FHA/VA 65% and 55% of the time, respectively, meaning fewer traditional bank institutions meet their needs as fewer are offering the government-insured loan programs that have been vital to homeownership opportunities. In order to ensure greater access to homeownership opportunities, particularly for LMI households, Prosperity Indiana believes it is critical to examine the fair housing implications in these denial rates. We also need to explore safe, alternative mortgage products that better meet LMI household needs while incentivizing traditional banks to expand their lending to them again. The Network and Resources Manager is the lead staff person for the Assets and Opportunity Network. The position will develop a work plan for the Indiana Assets and Opportunity Network, which will outline strategies to build Network capacity, help Network members deliver measurable asset-building outcomes, and change public policy to support asset-building strategies. The Network and Resources Manager works in partnership with the Policy Director and Asset and Opportunity Network partner agencies to build the Network and deliver on its work plan. Additional networks may be developed to build engagement and capacity across Prosperity Indiana’s membership. The Network and Resources Manager will also support fundraising strategies that generate resources for all Prosperity Indiana programming. The position will document and communicate the Prosperity Indiana mission and programs, benefits of membership, and tell the story of impact for Prosperity Indiana member organizations to raise funds. This includes identifying and soliciting individual and corporate donors, establishing an annual giving campaign, and supporting grant writing through initial drafting. Interested applicants should send a resume to Executive Director Jessica Love at jlove@prosperityindiana.org. As the Indiana General Assembly convenes today for a special session to address bills not completed by the sine die deadline, Prosperity Indiana is joining statewide human services advocates urging opposition to a provision in HB 1316 that reduce Earned Income Tax Credit benefits for low-income Hoosiers. The recently passed federal tax law made changes in how cost of living adjustments are calculated, called Chained CPI, which means the adjustments grow at a rate slower than inflation. State legislators backing HB 1316 would be approving the same calculation change. From these changes, the Institute on Taxation and Economic Policy projects recipients will lose $12 million in federal EITC and $700,000 in state EITC returns in 2019 alone. The General Assembly is about to green-light a measure that will cut credits and raise taxes on low income working families by $5 million by 2027, but it doesn’t have to be that way. The Earned Income Tax Credit (EITC) is a widely utilized, and extremely successful, tax benefit for low income individuals that was originally created in the 1970’s and then expanded during President Ronald Reagan’s tax reform efforts of the late 1980’s. In Indiana, working families with children that have annual incomes below about $40,320 to $54,884 (depending on marital status and the number of dependent children) are eligible for both a federal and state EITC. The state credit is simply the amount equal to 9% of their federal credit. That percentage is set statutorily by the General Assembly, and while the state credit is a percentage of the federal credit, the credits themselves are not officially coupled (this is important and you’ll see why below). The reason the EITC is so successful is that it is fully refundable. This means that the credit, which incentivizes work, can wipe out a family’s tax liability, and if any credit remains will be provided to the taxpayer in the form of a tax return. This extra money in a family’s pocket is often used for emergency expenditures, school supplies, household needs, etc., which can be the difference between making it and falling off a fiscal cliff for low income Hoosiers. Nearly one hundred percent of the dollars refunded to eligible families are pumped back into our local economy, and the program itself has been supported by leaders of both parties including President Obama and Speaker Paul Ryan who together supported an expansion of the program as part of our economic recovery from the Great Recession. Unfortunately, Hoosiers who use the program are on the verge of seeing a huge tax increase with the recent passage of the federal tax bill, combined with the passage of House Bill 1316 during the special session of the General Assembly this week. Tucked into the federal legislation was a new way of calculating cost of living adjustments for the federal EITC. This new method, called Chained CPI, will constrain these adjustments so that they grow at a far slower rate than normal inflation. Among the various provisions of HB 1316, which was drafted in large part to protect some of Indiana’s biggest and most important companies from seeing large increases in their state tax liabilities as we reconcile our tax code with the federal legislation passed by Congress earlier this year, is a provision that will require Indiana to coincide with the use of Chained CPI. The end result of both the federal and state legislation will be a large tax increase on low income Hoosiers who claim the EITC. The Institute on Taxation and Economic Policy (ITEP) projects that in 2019 recipients will lose $12 million in federal EITC and $700,000 in state EITC returns. The burden on Hoosiers continues to grow exponentially and by 2027 they are projected to lose at least $86 million federally and $5 million more from the state EITC. Although the state and federal governments view any EITC expenditures not received by taxpayers as savings, make no mistake, it is a tax increase on low income working Hoosiers, and a big one at that. $91 million big. But there are other options that Indiana isn’t considering. Because Indiana’s credit is not officially coupled with the federal credit, as mentioned previously, we do not have to utilize this new method of calculation for the State’s EITC. Federally, low income working Hoosiers are already projected to lose tens of millions of dollars. There is little we can do about that unless we can convince Congress to amend or repeal its most recent tax legislation. But, we can do something locally with regards to the state EITC. Another $5 million out of the pockets of low income working Hoosiers, and local economies, is real money that cannot be ignored. Unfortunately we at the Indiana Coalition for Human Services were not able to convince lawmakers to remove this provision from HB 1316, but it is our hope that we can work with them over the summer and fall to find a solution to this problem, just as Indiana’s largest employers were able to find solutions to their tax liability problems in this legislation. We believe there are a number of options that are worthy of consideration, and we look forward to the opportunity to make our case. David Sklar is Assistant Director with the Indianapolis Jewish Community Relations Council and Chair of the Indiana Coalition for Human Services Public Policy Committee. The Indiana Coalition for Human Services is a nonpartisan coalition of over 25 organizations that educates decision makers and the community on fact-based human service policy which emphasizes quality outcomes for Hoosiers, and ultimately the State of Indiana. We invest in, protect, and advocate for children, people with disabilities, senior citizens and hard-working families who are trying to make a better life for themselves. The Coalition for Homelessness Intervention and Prevention (CHIP), in partnership with the Indiana Housing and Community Development Authority (IHCDA), is soliciting workshop presenters for the Indiana Housing and Homeless Conference, which will be held Friday, August 24th, 2018, at the Drury Plaza Hotel Indianapolis Carmel. This statewide conference will convene housing and service professionals to learn more about best practices on a variety of topics while offering networking opportunities. The audience comprises many sectors of the homeless housing and services fields. CHIP and IHCDA are seeking dynamic and creative speakers to lead breakout sessions on August 24th. Proposals should address the following topics as they relate to the homeless housing and service provider industries: leadership, resource development and fundraising, marketing and communications, rural homelessness, special homeless populations, strategic collaborations (faith-based, health, criminal justice, etc. ), crisis-response, permanent housing, direct service (harm reduction, housing first, income, etc. ), family homelessness, substance abuse disorders, and any other topic that would enhance the housing and service providers' learning opportunities. Successful proposals will provide timely insight into the covered topic and have clear learning objectives for the attendees. Please complete the Call for Proposals Survey by 11:59 p.m. EST on Friday, May 25th, to be considered for this event. Contact Chris Lakich with any questions at clakich@chipindy.org. Mr. Kingsley has been with the agency more than 7 years, beginning as a Financial Capabilities Instructor, later serving as the Financial Capabilities Program Manager, and currently serving in the VP Resource Development role. During that time, he has had extensive involvement in the development and expansion of Lacasa’s Financial Empowerment services, spearheading new partnerships, developing curriculum, and introducing new technologies to workflow processes. He has overseen growth in fundraising efforts and a recent agency brand refresh. A new level of service in Elkhart County is exactly what is outlined in Lacasa’s strategic plan. The plan recognizes a need for more financial empowerment services, housing options, and neighborhood revitalization work throughout the county and outlines strategies for scaling Lacasa’s effective services to impact more people and neighborhoods. Mr. Gautsche will have served as Lacasa’s President/CEO for 17 years when he retires. He has overseen tremendous growth and change at Lacasa during his tenure in leadership. This growth is highlighted by an increase of 550% in net assets, an increase in Lacasa residential communities from 109 units to 327 units, more than 500 families assisted in purchasing their first homes, and over 150 home owners who could not afford needed repairs being assisted. Click here to view this post on Lacasa's website. On Wednesday, April 25, the Trump Administration proposed a new plan to raise rents on millions of low-income families and individuals receiving federal housing assistance. It's a plan that jeopardizes housing stability for households who, absent this housing support, could very well become homeless as Prosperity Indiana's Policy Director, Kathleen Lara shared with Fox 59 news. Just how many households would be affected in Indiana? According to research from the Center on Budget and Policy Priorities, 79,100 Hoosier households would be affected, with an average annual budget increase of $760, draining $59,445,000 from the most economically strained households throughout the state. The Secretary of the U.S. Department of Housing and Urban Development (HUD), Ben Carson, told reporters that the proposal was needed because "The way we calculate the level of assistance to our families is convoluted and creates perverse consequences, such as discouraging these families from earning more income and becoming self-sufficient." The bill would also increase rents for households with high medical or child care expenses by eliminating income deductions for those expenses, the impact of which would disproportionately fall on seniors, people with disabilities, and families with young children. The bill provides the HUD secretary with the authority to impose even higher rents through alternative rent structures and de facto time limits. And the proposal allows housing providers to broadly impose work requirements, without any resources to help people gain the skills they need for well-paying jobs. This is not a plan that lifts Hoosiers in poverty, it sets them on a course for housing crisis, particularly single mothers and the disabled. Prosperity Indiana is proud to advocate on behalf of our member network and how this measure would impact our communities, so please contact Kathleen Lara at klara@prosperityindiana.org for questions and stories from clients who will be impacted so we can share those specifics with policymakers. Raise your voice! Let both Senators as well as your Member of Congress know that this move would make it harder for low-income Hoosiers trying to become economically sufficient and could increase evictions and homelessness throughout our state. To look up your Member of Congress, visit our Advocacy Action Center and enter your address. On Thursday, April 19, Gov. Eric J. Holcomb announced the 156 census tract Opportunity Zone nominations Indiana submitted to the U.S. Secretary of the Treasury. Contained within the 2017 tax reform legislation passed last December, Opportunity Zones offer tax incentives to spark investment in low-income communities. Essentially, each state nominates census tracts that meet certain criteria, such as having a poverty rate of at least 20 percent and a median family income of no greater than 80 percent of the area median. (see this link for further details: https://www.enterprisecommunity.org/resources/policy-focus-opportunity-zone-program). The program only allows states to nominate up to 25 percent of eligible tracts, so the Governor’s Office noted that it worked several state agencies, an external advisory group and took into account thousands of tract recommendations from several hundred local officials, stakeholders and citizens in coming up with the selections. According to the Governor’s office’s announcement, “The 156 nominated census tracts are located in 58 counties covering all or portions of 83 cities and towns throughout the state. Upon approval of the Secretary of the U.S. Treasury, these Opportunity Zones will cover over 1,000 square miles and the residences of over 500,000 Hoosiers. The average poverty rate in these census tracts is 31 percent. The full list of nominated census tracts can be found here. As this program has great potential to support and generate new community development activities in economically divested areas throughout Indiana, Prosperity Indiana submitted the following feedback during the input process to help inform our state’s approach in determining which tracts to nominate. On behalf of our members working hard to revitalize and strengthen communities statewide, we are pleased the state has decided to capitalize on this important tool that could have a catalytic impact on low-income neighborhoods throughout Indiana. We recognize it is a significant challenge to identify which census tracts should ultimately receive the designation as our state can only nominate up to 25 percent of eligible tracts. In order to maximize the impact of the opportunity zone investment and its ability to improve lives and boost local economies, we offer the following suggestions for evaluation criteria. 1) Local context and conversations are key. In states that have selected tracts already, selection appears – in some instances – to be based on data only, ignoring local context. For example, some areas meet low-income eligibility thresholds due to student populations; however, investors are already capitalizing companies, commercial developments, or housing projects in those areas, and no incentive is needed. The context, in those cases, was not considered, and the impact of investing there would be to the detriment of communities that truly need the establishment of zones to spark investment. Data, while essential in helping evaluate need, is not a complete picture in and of itself. Conversations, community plans and resident engagement is key to achieving social and economic inclusion, as well as investments that yield long-term economic prosperity. 2) We urge the state to apply the New Market Tax Credit’s definition for “severe economic distress” in selecting zones to drive resources to the areas of highest need. Then, once that criteria is applied, we suggest evaluating additional factors, such as an area’s capacity to capitalize on new investments, taking into account strong anchor institutions and support for small business. 3) We believe designated zones should show a preference for geographic diversity with a balance of rural and urban neighborhoods to diversify investment activity. This will ensure urban cores are thriving, while rural markets that have lost significant jobs and population are also revitalized. We appreciate the opportunity to discuss the importance of community engagement, strategic evaluation of needs and opportunities, and geographic diversity to achieve the catalytic community economic development results the program aims to accomplish. Last week, The Wall Street Journal published an article about the miraculous economic recovery in Elkhart, Indiana. In March 2009, the unemployment rate in Elkhart was 20 percent, the highest in the nation; in January 2018, the unemployment rate was 2 percent, half the national average. (Moody’s Analytics ranked Elkhart’s local jobs rebound as the largest among 403 metro areas analyzed.) The recovery is largely attributed to the region’s concentration of RV manufacturing jobs, which offer great pay and benefits. In 2016, the average annual salary for a worker was $68,000 and pay continues to rise. Other job perks resemble those provided by firms in Silicon Valley, such as “dream managers”—counselors who help workers plan vacations or handle family problems. The RV industry sets wages and standards to a level few competitors can match; yet, the picture of Elkhart’s economic recovery is not as rosy as first appears. WSJ describes Elkhart’s economy as “a Kuwait in the cornfields”—that is, operating like an oil economy, sensitive to booms and busts. And although some residents remain frugal during booms to weather the busts, systemic issues arise from lack of business diversity. The prospect of a factory job with great pay and benefits deters young people from attaining higher education or entering other industries. These trends cause two problems: workers’ skill levels remain low (they are not qualified for advanced jobs) and industries with comparatively lower pay (i.e. food service) cannot attract and retain employees, creating a mismatch between supply and demand. Case in point: "A McDonald’s failed to open for lunch last fall because managers couldn’t corral enough hands at $8 an hour to serve the lines waiting at the doors." Elkhart illustrates the importance of business diversity in terms of economic robustness, especially during economic downturns, and attending to the daily needs of neighborhood residents. Studies show that retail diversity—the availability of a wide array of necessary goods and services at a variety of price points—contributes significantly to a neighborhood’s economic health and that of its residents. In addition, retail diversity contributes to a neighborhood’s unique character (i.e. the cultural value of independent retailers as compared to chain stores). Yet the government’s role in preserving and encouraging retail diversity, affordability, and access is marked by “a history of fits and starts” when compared to the housing sector, for example, where government has consistently maintained a significant role. Historically, planning for neighborhood retail was often overlooked and/or outsourced to local organizations through Business Improvement Districts (BIDs). In an era when the public sector was in retreat, BIDs assumed the responsibility to stabilize physical conditions on important retail strips. Although the public sector can employ a number of strategies to preserve and encourage retail diversity (i.e. formula retail zoning), private funders also have a role to play. For example, funders may explore starting a neighborhood commercial development fund, a retail diversity fund, or incubator and entrepreneurship programs. A neighborhood commercial development fund would provide funding for local community developers to redevelop vacant or underutilized commercial spaces. Community development financial institutions in Indiana already fund similar types of projects. For example, the Local Initiatives Support Corporation (LISC) operates the Small Business Façade and Property Improvement Program, which provides matching grants to property owners willing to renovate storefronts, such as adding new signage, windows, or painting. A retail diversity fund would establish a new competitive grant program targeted specifically at the objective of neighborhood retail diversity. The fund could be granted to a local organization to administer a participatory community process to determine a specific type of retail use that is needed in the neighborhood. The community organization could then use the rest of the grant to help identify and subsidize the location of such a business. Another approach is to develop and fund incubator and entrepreneurship programs. Recommended interventions include helping program graduates find affordable storefront space by subsidizing a short-term initial lease or offering low-interest loans. These programs can also be effective at diversifying local business markets. Marcus Owens, President and CEO at Northside Economic Opportunity Network (NEON) in Minneapolis, MN, said there is saturation in the market of certain types of businesses—for example, beauty parlors and comfort food restaurants in NEON’s service area. NEON provides training and funding opportunities to diversify aspiring entrepreneurs’ skills sets thereby diversifying local business markets. Supporting retail diversity through innovative funding strategies isn’t the silver bullet to addressing problems associated with the concentration of particular jobs, but it is part of a comprehensive solution to build workers’ skills sets, increase a region’s economic robustness, make neighborhoods desirable places to live and work, and attend to residents’ daily needs. STATEHOUSE (April 19, 2018) – Today, Lt. Governor Suzanne Crouch announced six regions as finalists for the 2018 Stellar Communities Program. Launched in 2011, the Stellar Communities Program is a multi-year, multi-million dollar investment initiative led by the Office of Community and Rural Affairs, which is overseen by Crouch. The program works with communities to develop their strategic community investment plans, promote local and regional partnerships and implement comprehensive solutions to challenges facing Indiana’s rural communities. "The Stellar Communities Program has helped so many areas across our state, and I am inspired by the collaborative efforts of these six regions," Crouch said. "Working together, and heading towards a common goal will allow for a better, stronger Indiana." Representatives from the Stellar partner state agencies began examining the letters of intent following the April 6 deadline. New Allen Alliance – comprised of Allen County, the town of Grabill, Leo-Cedarville and Monroeville and the cities of New Haven and Woodburn. As finalists, regions will receive a planning grant to build upon their regional plans. Each region will begin working with Ball State University’s Indiana Communities Institute to discuss project alignment and continued planning efforts. Final designees are selected at the end of the year. Through the annual designation, the Stellar Communities program provides resources for transformative quality of place community improvements by utilizing previous planning efforts, leveraging existing assets, fostering regional investments and stimulating continued growth. Visit in.gov/ocra/stellar for more information.